It is war time in Tollywood. Two producers, both belonging to the Telangana region locked horns over the distribution rights of Attarintiki Daaredi. 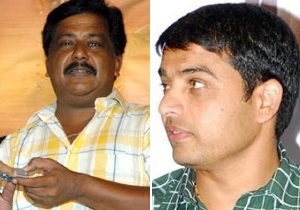 Their rivalry is not new and things haven’t been hunky dory between Sudhakar Reddy and Dil Raju for a long time. The latest move was made by Sudhakar Reddy. He acquired the rights of Attarintiki Daaredi for the Nizam region. It has been a norm for Dil Raju to take up the distribution rights for Nizam area for all films of the Mega family. The last film he distributed was Pawan Kalyan’s Gabbar Singh. But this time around, Sudhakar Reddy made a quick move and grabbed the Nizam rights for AD. There are rumours that Sudhakar Reddy has played a crucial role in ensuring that Attarintiki Daaredi releases on August 7. This would mean that Yevadu which is being produced by Dil Raju will have just one week to do business before Pawan Kalyan’s film hits the theatres. Sudhakar Reddy is also said to have bought the rights at a higher rate to hit back at Dil Raju. Though he has been keeping low for some time, the success of Gunde Jaari Gallantayyinde has brought Sudhakar Reddy back into action. We’ll keep you posted as to who wins this game of one-upmanship.